Many successful students say that always using a notebook is an essential tool when learning a language. I think this is true, but I also think that such a statement is far from enough. How can a notebook help us improve? Why is it important to always have one with us? What should we write in it? In this article, I will answer those three questions from my own point of view. I’m also interested in hearing what readers have to say about using a notebook to learn Chinese! Before I proceed, I’d like to make clear that when I say “notebook”, I simply refer to any of various ways of writing things down. If you’re used to using a smart phone or tablet to write things down, then by all means do so. I think a paper notebook is still superior because it’s easier to use and never runs out of batteries, but to each his own. What I have to say below is relevant regardless if you record on paper or digitally. You won’t forget to learn cool/interesting/important words – When I encounter a word I think I really should know or an expression that I want to learn, the first thing I do is to write it down in my notebook. It’s seldom enough simply to hear it once and if I want to learn it, I need to write it down. Most learners are like me, we might pick up words automatically sometimes, but actually writing them down and studying is they way to go. You don’t risk losing important insights – Insights into language learning or language usage seldom comes when sitting in front of the computer. Rather, they tend to pop up randomly, often when it’s inconvenient or inappropriate to directly discuss or ask someone else. I typically have dozens of new ideas each lecture/lesson/seminar I attend, but it’s neither the right time nor the right place to bring up all of them immediately. I write most things down for later. You never miss an opportunity to ask questions – If you keep a notebook with you at all times, you will never miss an opportunity to ask questions. Back in the days when I didn’t use a notebook or when I forget to bring the one I use now, I often encounter situations where I can ask a teacher or a friend a few questions, but I can’t up with any. It’s hard to remembering words, grammar or pronunciation you think is tricky, but if you have them written down, you will never miss an opportunity to ask a question. You free your mind to do other things – I’m convinced that having a lot of things to remember burdens the mind and makes us feel stressed. Keeping a notebook is an excellent way of relieving our minds and thus freeing us to accomplish other things. This means that I don’t only write down words, ideas or insights in my notebook, I also write down anything else I think I ought to remember. That means that I’m free to focus on other things. Now that we have a general idea of why keeping a notebook with you is useful, let’s look at the practical details. What should you record and how should you record it? This is probably highly individual and I don’t expect this to be the best way for everybody, but in order to provide an example, I will explain how I take notes. Use a basic category system – In order to make it easier to find things later, use a very simple category system. For instance, I write “+” in front of new words I want to add, “?” in front of things I need to discuss with someone, “HC” in front of ideas related to Hacking Chinese, “R” before references (books or articles) I should record for future references. And so on. The details aren’t important, but the principle is. Record anything that sticks out – As discussed above, there are many reasons why you want to record ideas, words and other things. In short, anything that sticks out in the flow of Chinese I’m exposed to gets written down. This is related to the idea of mental models; I jot down most things that suggest that a change in my mental model of Chinese is necessary, especially if I think that I might have been wrong about something and need to verify this somehow. 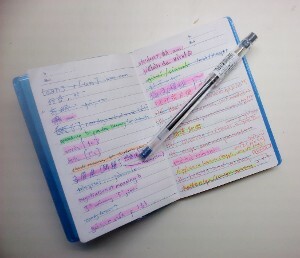 Provide context and/or explanations – When I first started using a notebook to learn Chinese, I often made the mistake of not giving enough context or explanation of what an idea meant. Perhaps I felt that I would surely remember the context, but that was seldom the case. When I went through the list of things I’d written during the week, I often stumbled on notes that sounded cool and interesting, but that I had basically no idea what they meant. So, provide context, provide explanations. Rather write a few words too many than too few. Keeping a notebook without ever going through it is next to useless (albeit not entirely, but this is off-topic). Thus, before I round off this article, let’s a have a brief look at what I actually do with my notebook after I’ve recorded things in it. Solve whatever problems I can solve on my own. If I can’t solve the problems myself, I look if someone is available to help me, perhaps through social media or on online forums. I’ve written much more about this in the article about language question triage. Mark the remaining questions with colours indicating when they can be solved. For example,yellow might mean “ask teacher A”, green might mean “discuss with native speaker friend B”, blue might mean “consult advanced second language learner C”. This means that next time I meet A, B or C, I can easily see which questions I want to ask or what interesting topics I want to discuss. Also, these questions are out of the way and won’t bother me until I have a chance to actually resolve them. Sort ideas, insights and other notes. Most of the things I write down aren’t questions as such. These notes should be transferred to the appropriate place. I keep a fairly complex system of notes for Hacking Chinese, a much simpler one for teaching and learning Chinese in general and just a text file for the rest. Consider if the idea is worth saving, and if it is, store it where you can find it later. Cross out resolved questions, highlight forgotten ones. This might sound obvious, but it’s essential to mark clearly which notes are already taken care of, otherwise you will soon be overwhelmed. Similarly, you will probably forget or overlook questions, so if you find old questions you haven’t resolved yet, highlight them in some way so you won’t forget them. I think keeping a notebook is essential. It increases productivity, makes sure you don’t forget important things and just makes life easier in general. I didn’t really notice how many cool/interesting/important things I forgot before I started writing everything down and went from having a fair number of ideas to having more ideas than I can possibly carry out. I’m also much better at following up language-related questions nowadays. If I find words or grammar I’m not familiar with or can’t use, they are seldom overlooked. This not only feels better (you don’t get the “this is the third time I don’t know what this is” feeling), but it also makes my Chinese more solid by gradually plugging holes. I don’t expect you to use a notebook the same way I do, but I still recommend you to keep one in a manner than suits you. If you’re already doing this, please share your thoughts in the comments. How does your method vary from mine? What reasons do you have to keep notes? Well, I don’t use a ‘notebook system’ that is anywhere as close to as organized as what you present here. My ‘notebook’ is … whatever book (usually a novel or comic book) I’m currently reading in Chinese. I also sometimes use travel books this way (many travel books have blank pages in the back for notes). If the notes are relevant to the reading material, they get posted on the relevant page (so they are right next to the context). If the notes are unrelated to the novel/comic, I put them on the page with the publishing information (which usually has some white space). Sometimes I also carry pieces of scratch paper in the books I’m carrying, which also often get filled with notes (though these notes are usually not about Chinese). I don’t have a tablet or smartphone, and when I’m out of home I try to keep my weight down, so I don’t want to carry around a paper notebook separate. However, since I always carry with me something to read (for train rides, for long lines, etc), it can serve the double-purpose of being my notebook. Whenever the notes I make are of any value, I always transfer to my computer or other place where I can refer to them later, and then I never need to see the original notes again. I bought several books in the Chinese Breeze series of graded vocabulary novels. My system was to photocopy/enlarge each page, then write vocabulary (characters, Pinyin, & English translation)in the margins as I learned new characters. Then I compiled a separate word list in columns on a folded blank sheet of paper to refer to when reading other passages in Chinese. Lately I’ve been copying these lists alphabetically into my iPad/iPhone (Notes application) using the built-in diacritics in the iOS. I activated a couple of Chinese keyboards so that I can easily insert the characters as well as the Pinyin. Now I have my own personal Chinese/English and English/Chinese glossaries. I might be missing something here, but wouldn’t it be hugely more effective to save at least important words in any kind of space repetition program? I also have my own dictionary (basically), but I also get the reviewing feature automatically. This is in a sense a way of taking notes, although the critical part is how to get the words (and which words to get) from the book to whatever program you’re using. For instance, I find it way too distracting to stop reading to record words, I just make a minimal pencil mark in the book and go through it later. Olle, I use PlecoDict for my spaced repetition and have a ton of self-selected words in there. What I have created is a personal dictionary in both directions of words I need most often. I look things up in these glossaries, which isn’t what I use spaced repetition software for. I find it actually saves time to write down the word the first time I encounter it, then I can look back the next time if I’ve forgotten it. I don’t try to enter it into my iPad/iPhone until later. The good thing is that these “dictionaries” are always with me and I can scroll through the Notes file very quickly to find the word from either English or Chinese, and it has both the pinyin and the characters. I can also enter phrases as well as single words, which is trickier in a spaced repetition program like PlecoDict, where you are essentially marking a word in it’s built-in dictionaries. Thank you for another great article. I completely agree. I use my ipod touch to take notes which is nice because it’s small and always with me. When I used to write stuff down in notebooks, I realized that if it didn’t fit in a pocket, I would never have it with me when I needed it. Anyhow, I make quick notes on my Ipod when I hear new words that I don’t understand or hear something that I’d like to remember. Possibly more important for me, I try to keep track of the times that I’m struggling to get my point across in Japanese. I can almost always make myself understood to some degree but I find there is often a better/simpler/more natural way to say what I’d like. I make a quick note of the subject/situation. Later when I meet with my Japanese tutor, I try to explain the same thing to him and ask him to give me feedback or explain it back to me in his own way. As Olle Linge mentioned in the above comment, all of these notes get put into Anki at the end of the week, hopefully in the form of a full sentences (not just the word) with a meaningful context. I tend to add a “?? ?” to the end of a sentence if I’m unsure about it or need to ask a native speaker about it. This makes them easy to search for in anki and also they stand out in my list when I have time to ask my tutor. Thanks again for another interesting article! Keep up the good work!! I took the liberty to move your comment to the right article and remove the others. The challenge will be published later today, stay tuned! Paper really is the best, because the act of writing is deliberate…. Also, in Chinese, it’s easy to throw pinyin out… You spoken Chinese will improve, but knowing how to text something and knowing how to WRITE are two different things. It’s not like other languages where spelling equals writing… There’s no sounding out your words in Chinese… Just use a pen and paper….